BMW has given the X6 a mild facelift with subtle changes to the exterior styling, new paint colours and the introduction of a high performance diesel - the M50d. The new models go on sale in June. The new engine is a straight-six 3.0-litre twin turbo diesel with 381PS and a huge 740Nm of torque making it the most powerful diesel engine BMW has ever produced. That gives a 0-62mph time of 5.3 seconds, yet it's still efficient considering the performance it offers with an average claimed economy of 36.7mpg and emissions of 204g/km of CO2. The standard eight-speed Sport automatic gearbox has been configured to deliver rapid gearchanges with an uninterrupted flow of power. There are two automated shift programmes, D and S, but the driver can also change gear manually via the gearlever or steering wheel-mounted paddles. 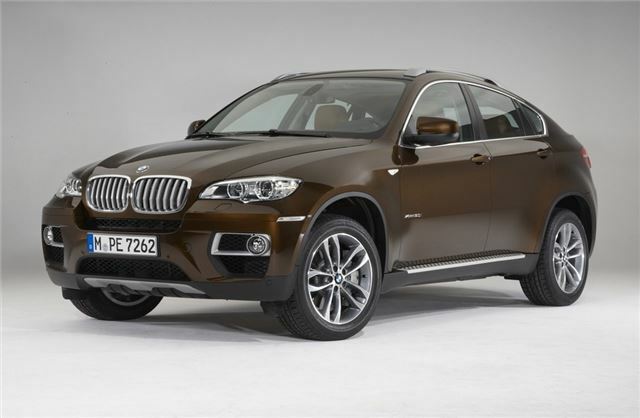 In terms of styling the facelifted X6 gets a wider chrome frame at the front and redesigned foglights. As well as the standard xenon lights, adaptive LED headlights are available as an option. At the back there are revised light clusters with two horizontal LED glowing bars. There are also new metallic paint colours - Orion Silver, Midnight Blue and Marrakesh Brown - along with two new upholstery trims, Ivory White Exclusive Nappa Leather and Vermilion Red Nevada Leather. Meanwhile the BMW X6 M and BMW X5 M also get styling changes with the addition of Aluminium brake callipers in blue and become the first BMW models to include Adaptive LED Headlights as standard. In addition, the BMW X6 M also gains a 'Powerdome' bonnet enhancing its athletic stance. The new BMW X6 is available from £46,725 OTR for an X6 xDrive30d, while the BMW X6 M50d will be available from £62,260 OTR. The BMW X6 M is priced from £85,680 OTR. All models go on sale in June 2012.